County Kerry's Yaqoob Ali picked up the Munster Reds Player of the Year accolade at the Munster Cricket Awards, which took place on Friday October 12th at Cork County Cricket Club. Lahore native Ali, had an impressive IP20 series this year, taking 12 wickets in six matches at an average of 14.08, including taking 4-29 in the opening game against Leinster, as well as helping Kerry capture their first ever Munster Senior Cup title. On a memorable night for the Tralee club, they were also named Munster Club of the Year, recognising not just their achievements on the field, but also the ongoing progress at their new Oyster Oval facility. The award was accepted by club President Blanche Rutland. After a historic season for Munster Cricket - which saw its Interprovincial side the Munster Reds pick up their first ever victories in List A cricket, and Limerick CC become the first side ever from the province to reach a national final - Friday night's awards ceremony provided an opportunity to reflect, recognise, and honour those who have had an outstanding 2018. Off the field, the newest accolade - The Spirit of Cricket Award - was given as a joint award to to North Kerry's Gary Picket, and Limerick's Maaz Mohammedi after similar incidents. The award nominees are put forward by rival clubs, who wish to recognise an outstanding demonstration of the Spirit of the Game, which appears in the laws’ preamble and continues to be a founding stone of the game. During North Kerry's Division 3 game against Limerick, Picket granted an inexperienced Limerick batsman not one, but two lives, after the youngster was run out walking to his non-striking partner before the ball was declared dead. Mohammedi, meanwhile, was captaining Limerick's thirds against Cork Harlequins in a Division 2 when his counterpart Joe O'Mahony was given out for lbw on appeal, and at just 17, the youngster showed leadership skills beyond his years, in withdrawing his side's appeal having seen bat before pad. For his six years of hard work with Munster Cricket as coach, youth officer, and representative, Limerick's Chris Thomas was rewarded with the President's Award, given to those who perform outstanding work for the Union outside the boundary. It was also a good night for Cork County's first side, who picked up their All Rounder Cricket Premier Division and T20 Blast medals, before club captain Cormac Hassett was co-awarded Munster Heat batsman of the year award alongside Cork Harlequins’ Ruadhán Jones, while another experienced spinner, Abubakar Saddique, was given the bowling title. At Provincial level, Limerick's young all-rounder Murtaza Sidiqi received the batsman of the year title at Premier Division, with astonishing figures of 460 runs in 8 innings, averaging over 76 runs a game - which included a massive unbeaten 175 against Kerry. Young Quins seamer Senan Jones broke the mould of the slow bowlers by picking up the Premier Division of the year award. His 5-39 against Limerick was one of two five-wicket hauls in a season which saw the teenager take a wicket just over every 17 balls, taking 22 scalps in 10 league games, as well as a further 10 across various cup competitions, showing that the Irish underage international is showing he's capable of stepping up to the next level. 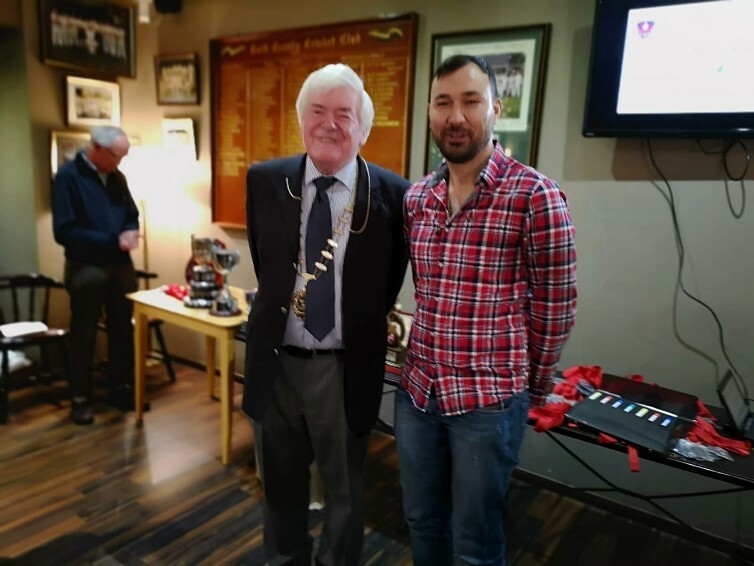 In the lower divisions Limerick received their medals for winning the Division 1, Junior Cup, and Division 3, while Tipperary County received both the Division 2 and the Div 2 T20 tropgies, while Praveen Poulose won the award for best bowler. Munster Cricket would also like to acknowledge the support of sponsors All Rounder Cricket in 2018, whose assistance has been crucial to the Union's continued success. All Rounder Cricket Munster Division 3 Bowler of the Year: Talha Kayani (Cork County).